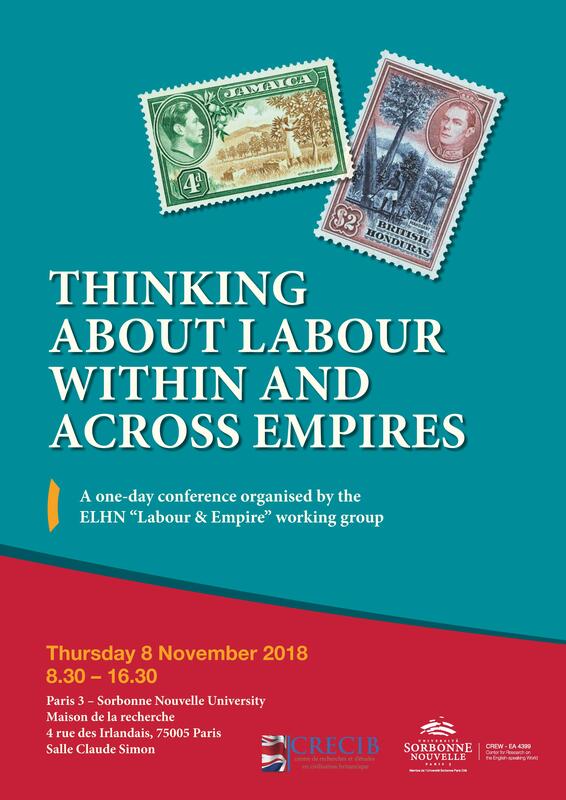 In the wake of the 2nd conference of the European Labour History Network (ELHN) at Nanterre (2-4 November 2017), and with the 3rd ELHN conference (Amsterdam, 19-21 September 2019) already in mind, the ELHN “Labour & Empire” working group is organising a one-day conference at Paris 3 – Sorbonne Nouvelle University. Labour history over the past decade has become more global in its outlook – a welcome mutation that has not made national, regional and local studies redundant, but has allowed historians to ask old questions from a different, broader angle and also to embrace new objects and new methodologies. The history of the British and more generally of the European and “Western” working classes can no longer be explored without consideration of the transnational character of capitalist development and of the cosmopolitan dimension this gave to class formation. The benefits of a global approach are possibly even more evident in the study of labour in the Global South, be it in the age of empire or in the post-colonial era. The trannational and global turn should not, however, flatten and homogenise the experience of labour – the risk being a privileging of connection and unity over divisions, of subaltern agency and co-operation over power relations, of movement and mobility over fixed hierarchies. and across empires, and the way States and employers tried to keep their migrant and diasporic workforce under control; both the cosmopolitan shapes of worker resistance and the racist, repressive practices imposed in the workplace and within certain territories to discourage collective action. Access to the conference is free. Please contact Yann Béliard (yann.beliard@sorbonne-nouvelle.fr) and Gareth Curless (g.m.curless@exeter.ac.uk) if you wish to attend the event. For financial support the organisers wish to thank CREW (Centre for Research on the English-speaking World) as well as the Sorbonne Nouvelle's Research Commission. Click here [PDF - 1 Mo] to download the full programme.